Things are heating up in Des Moines, and it’s only the second week of the 2019 session! Since our recent email that laid bare the facts behind why some lawmakers want to pass the Constitutional Amendment and kill Constitutional Carry legislation, many of you have contacted your lawmakers insisting they cosponsor this bill! To summarize our previous email, 44 states already have a Constitutional Amendment in effect, and not one of those have stopped any gun control bills from taking effect! Our right to keep and bear arms, just like all of our Constitutionally guaranteed rights, are only safe as long as people like you and me fight to protect them and politically crush lawmakers who try to strip these rights away! There is no miracle cure to stop gun control. We have to fight, year in and year out, to advance our gun rights and to stop gun control dead in its tracks. It’s been that way since the founding of this country. 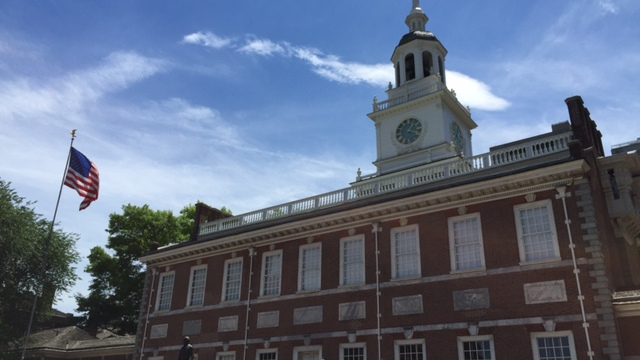 Ben Franklin, when he walked out of Independence Hall after the founding fathers finished drafting the US Constitution, was asked what sort of government the founders laid out. Safeguarding the right to keep and bear arms for the next generation is our job, and it requires work, as no Constitutional Amendment will stop committed gun-grabbers. But legislators love this concept, as they can pass this language knowing that it has no policy value, and then claim to be pro-gun to their voters — all the while working to kill Constitutional Carry! Is passage of this amendment a bad thing? Will it do anything to protect our gun rights from anti-gun judges or lawmakers in the future? As gun owners learn about this and question their lawmakers about why they won’t cosponsor Constitutional Carry, legislators are getting nervous. Iowa Gun Owners is misinformed, and trying to confuse the issues. In their ignorance, they don’t know the difference between strict scrutiny and older RKBA language. Our version will be stronger, guaranteeing their protections for future generations. IGO is lying to you. Ah yes, strict scrutiny, maybe this is the magical bullet that will stop all future gun control laws from attacking our freedoms? Missouri passed the strict scrutiny standard in 2014. And right now, in Missouri, there are dozens of places that are off limits to gun owners via gun-free zones in violation of that Constitutional Amendment. Even more, Senator Jill Schupp and Rep. Deb Lavender are trying to pass ‘Red Flag Gun Seizures,’ while other lawmakers are trying to repeal the state’s Constitutional Carry law! How can these legislators be free to advance gun control in a state with the strict scrutiny standard in their state constitution? It’s because lawmakers simply don’t care about the constitution, whether it has strict scrutiny language or not! It’s not just Missouri. Louisiana enacted the strict scrutiny standard in 2014, as well. It’s supposed to stave off gun control, right? Well someone should tell that to gun-grabbers in the state capitol, who, last session, filed a massive number of gun control bills. From 10-day waiting periods and an outright ban on ‘assault weapons,’ to raising the age on when you can buy a firearm, to efforts to track every round of ammo sold in the state, radical gun grabbers went for broke! Were their bills ruled ‘out of order’ because they violated the state’s constitution? These gun control bills were killed in the legislative process that same way that gun control bills are stopped in states without a strict scrutiny standard — by mobilized gun owners who poured pressure on lawmakers! That’s the only way to stop gun control, and we all know it. Lawmakers know how ineffective this amendment would be, but they don’t care. This issue makes for great fodder in their next reelection campaign! So any lawmaker who tries to tell you that he won’t support Constitutional Carry because of the Constitutional Amendment is simply trying to deflect pressure. And any lawmaker who smugly tries to come back at you and tell you that they are just smarter than you are — bringing up the strict scrutiny standard — is trying to brow beat you into leaving them alone. In either case, don’t back down! Urge your lawmakers to cosponsor the Constitutional Carry bill being run by Senator Zaun and Representative Shipley by sending in this PRE-WRITTEN EMAIL right away! With over a dozen states already having this law on the books — and another 8 states working on it this year — it’s time that Iowa lawmakers finish this fight and pass Constitutional Carry! RENEW YOUR MEMBERSHIP FOR 2019 HERE! P.S. As word gets out about how useless the Constitutional Amendment has been at stopping gun control in the states that already have it, lawmakers are trying to pivot. They want you to believe that the Iowa language is better because of the strict scrutiny standard. But as you’ll see in the email above, that’s just political spin designed to protect lawmakers. Insist that your lawmakers cosponsor this critical legislation, being sending your PRE-WRITTEN EMAIL now! Donate today to help IGO fight in Des Moines! Over a Dozen Gun Control Bills Filed in Des Moines!